It was back in May 1995 that we made our first transport video in Hong Kong. So in November 2015 the independent transport videos cameras returned to Hong Kong to make yet another programme for you to enjoy, and to celebrate our 20 years of film production! We have returned to a number of the original filming locations, but have found many more to record the present day bus and tram action. It is a sobering thought that every bus we filmed on our first programme does not exist in Hong Kong any more, the Light Rail in the New Territories still use the same tram cars, but even most of the stately double deck trams on Hong Kong Island now carry new bodies. Since our last visit to Hong Kong in 2013, many new buses have been delivered to the three main operators, KMB, Citybus and NWFB. The first generation of air-con buses are now in small numbers and many familiar types have left the fleets. There is still a great deal of interest, as these four hours of action will testify! We start our journey in Kowloon, on the busy Nathan Road as we make our way down to the Star Ferry for the ferry crossing to Hong Kong Island. On the island we film at various locations in Central district and at Kennedy Town. We then ride on a Citybus 12m Volvo Olympian, 656 (HU 3984), still in it’s experimental Stagecoach Hong Kong livery on route 10 to North Point. After filming at the soon to be replaced bus terminus here we travel by ferry to Kowloon City Ferry Pier bus terminus to witness some of the evening peak services. Our next journey starts on Nathan Road as we travel to Tuen Mun on board 16-day-old ATENU794 (TU 2498), an Alexander Dennis E50D operated by KMB. At the bus terminus we see MTR Dennis Tridents in West Rail livery running alongside KMB and Citybus vehicles. We visit the Ferry Pier by Light Rail, and then make our way to Yuen Long for plenty of bus and tram action. A ride on the 64K service takes us to Tai Po and Tai Po Market, where the MTR East Rail buses are in evidence. A visit to the upper bus terminus at Sha Tin is next with more action filmed on Yuen Wo Road where we see one of only three remaining Leyland Olympians operated by Citybus on the Jockey Club contract. A visit to Sheung Shui situated close to the mainland China border completes part one of this special programme. Part two will not disappoint! We start with a journey to Tsuen Wan and Mei Foo, with a ride on brand new KMB Scania, ASUD1 (TE 7277), with Caetano bodywork back to Mong Kok, Kowloon for some night time action! 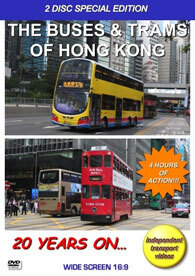 We then feature Aberdeen, Stanley and the busy Causeway Bay area back on Hong Kong Island. Our journey concludes on Lantau Island with a visit to Tung Chung and Discovery Bay featuring the smart Discovery Bay fleet that operates former Citybus MAN single deckers and brand new Volvo B9TLs with Wright Gemini 2 bodies, a fitting end to a very special visit and production from independent transport videos. We hope you enjoy it too!